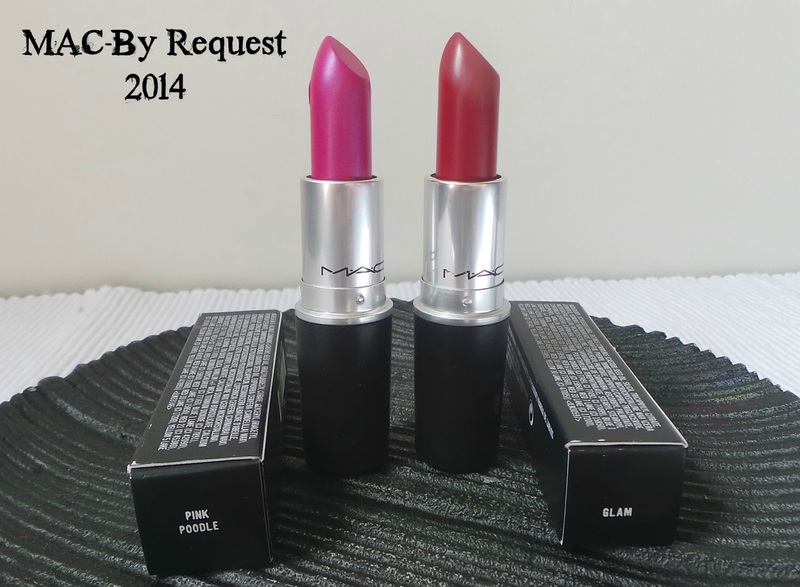 Meet Pink Poodle and Glam, the 86th and 87th addition to my monstrous MAC lipstick collection! 'By Request' is a brilliant little marketing scheme from MAC where fans of their facebook page can vote for their favourite discontinued lipstick, lipglass and eyeshadow shades to make a one time re-appearance before disappearing forever. Lipsticks are my thing (in case you hadn't realised) and I bagged two of the three shades. I would have liked the third but it was sold out-having said that 'Hoop' has been likened to the also limited edition 'Betty Bright' which I do own! The lipsticks come in the traditional black and silver bullet with the familiar vanilla scent. I guess any scent becomes familiar when you own 87 sticks of it! First up Glam-a matte vivid pink toned red. I got compliments in the office when I wore this yesterday and the colour is divine but the problem is I own 3 or 4 shades which are almost identical-Dior Minuit (LE), Chanel La Precieuse (LE), Mac Red and Nars Luxembourg. It's a tricky one to know whether to stick into my next blogsale or not because the colour is amazing and really brightens the face and the formula isn't too drying for a matte although I did place a dab of vaseline over the top after I photographed the swatch below. Next up is Pink Poodle. When I opened it I was like 'oh dear I will never pull that off' as it is literally neon in the bullet. But because it is a 'glaze' formula it actually looks fab on and is less in your face than the bullet. An almost lilac toned fuchsia pink. I have nothing like it in my collection and I am so glad I now own this lipstick! It just makes me feel like I want to wear it all the time! The glaze formula feels quite syrupy on the lips and leaves a glossy finish-just perfect for summer. These lipsticks are limited edition and exclusively online so snap them up whilst you have time! Oh Stacey you and those luscious lips of yours making me wanna GET DEM IN MAH BASKET!! lol it is isn't it!! I really love the glossy finish! Oh gosh, now I'm wondering if I need Pink Poodle!! !